hahahaha Well, you don't know Dave very well!! Heres my example of how it speeds up play and makes for a better/quicker round. I'm on green first, other two are walking around the green with their push trolleys. Old way was I would wait, then tend the flag for player 2, then player 2 tends the flag for player 3, then its pulled for me to putt. New way, I can putt while they walk around the green, hole it or not, then step back and let them putt in turn with no-one having to walk back and forth to the pin. Result is much faster and overall we have shaved nearly 20 minutes of a 4 ball round, and 15 off a 3 ball. I do the same thing, except I will putt out while the other guys are figuring out their chips. I am actually used to putting with it in on all putts now... just like Adam Scott, except I'm a better putter. ... I don't play those courses Kenny. Picture is from Aguila, a park district course and not a house to be seen. Same with Papago and one of my other favorites Verrado Founders, that has a few but mostly just desert, cactus and mountains. That's the way I like it. 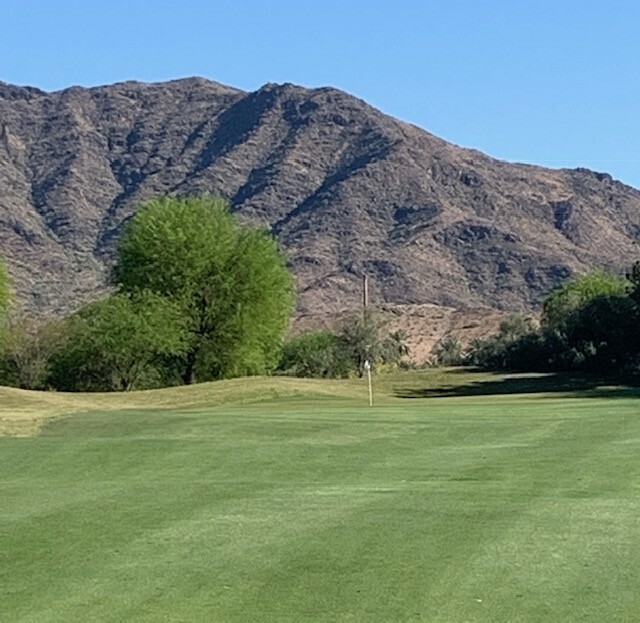 I was very disappointed when the old Thunderbird course, recently Vistal GC, up on the side of South Mountain was closed a few years ago to build houses. It was a very nice, inexpensive course. So... in a few years, who will be hitting the ceremonial tee shots?? Faldo, Langer and Olazabal are the likely multi-green jacket winners, then we are down to one-time winners until Phil quits playing. Absolutely beautiful!! 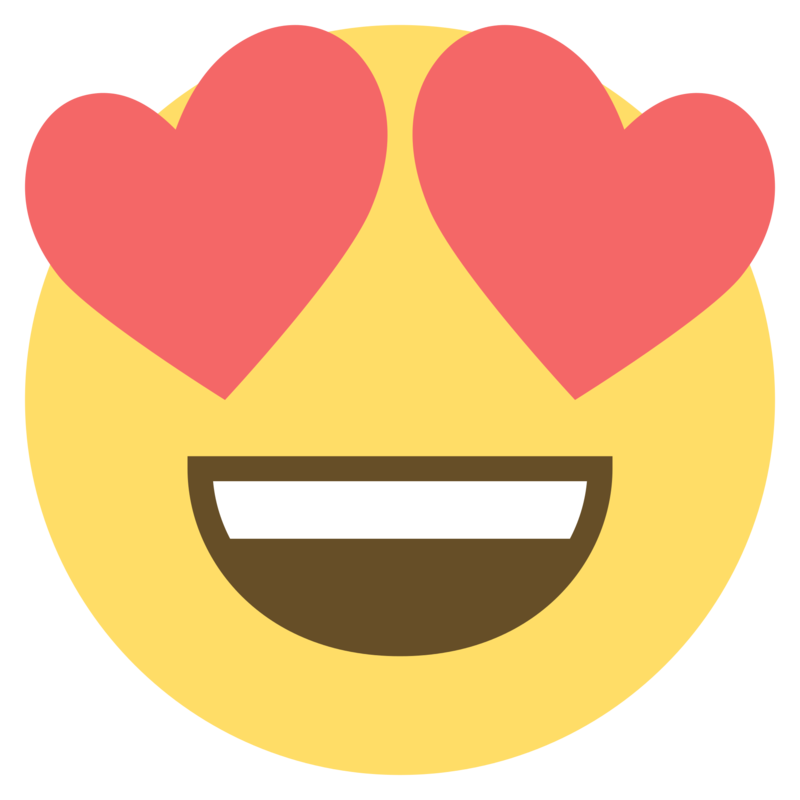 81º tomorrow and 70's for the next 10 days! Perfect for..... yard work. .... I have been playing Aguila here in Phoenix at twilite most every day. Greens are quite fast but a little bumpy, so not only difficult to read but putts tend to wander, especially downhill. The Mrs flew in today so I played "early" at 10:20 which is very early for me LOL. But the greens rolled much smoother earlier in the day so this bermuda either gets sticky in the afternoon or some poa is mixed in. Had 4 birdies and one bogie on the front then hit a log jam at 10 and waited 25 minutes to tee off and the wind picked up and I lost my mojo. Instead of hitting it close I was 20-30 feet or on the fringe and I also missed few fairways but mostly just didn't putt like the front 9. All pars and 1 bogie on the back and I am always amazed at how excellence can slip away so quickly. No complaints of course and played well on the back just not in sync like the front. In other words a typical day playing this silly, wonderful, frustrating and very rewarding game. Nice! Not many courses in the Phoenix area without houses/condos. While I like Phoenix, I like courses without backyards. If I ever play like that again, I’ll quit playing. I say that every week! It will all come together; don't sweat it!! On Sunday I shot 49/40=89 Didn't get a par until #11. My shoulder hurts; so does my back. Couldn't get off the tee. Today I played a course in town that I haven't played since last August. I was invited to join a game of Wolf. Sure, why not!! I'll donate this time... shot 80 with two doubles, which tied for low round. I was even invited back on Thursday. Now I'm playing with "house money". Did a DIY tap handle for the 128oz growlerwekrs growler today. Local place does $10 fills on Wednesday’s so it won’t be too pricy to fill. CO2 keeps it fresh and flowing. Nice!!! OK, what's in it??? 5 weeks in a row with 7 aces total. What is it with holes-in-one this year?? How long can this streak go on?? Well, I picked Rose and he missed the cut. I don't do very well picking players. It's nice to see Penny smiling again! I hope her date's injury wasn't serious... glad you filled in. Yes, music is different today than in 1974, or in my case 1965, but my mom said the same thing about music in 1965 being different than in 1947!! Heh, hadn't seen that one yet. I'm glad they didn't have me model for the diagram.. Where'd you find this baby? From an email from Ping yesterday. Rudys is kiling it at their downtown locale! Not sure where to post - "weather" or "how did you play". 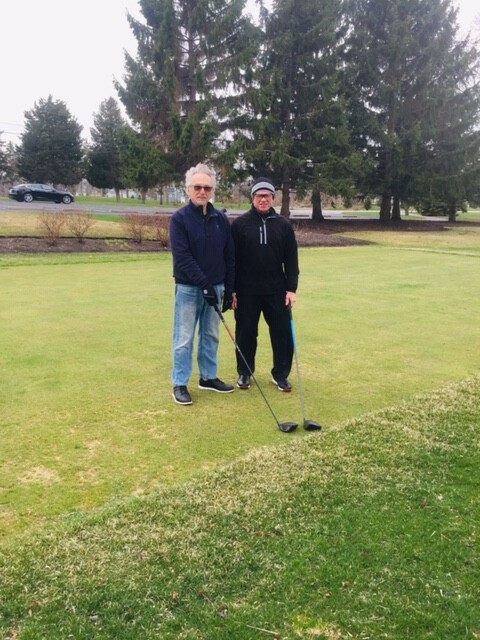 Our course opened today and as usual it was a cold 40* with winds gusting to 42 mph off of Lake Erie. That would be a wind chill of 28* for you southern boys and girls. My partner and I were first to play (I think everyone else cancelled ). The good news is that I found a new wind indicator; when you can see my receding hairline as in the photo - it means it's too windy for golf. I won't comment on the game - but at least the driver and putter were working. Brave not to be wearing a hat. I'm coming to Chi-Town to take lessons with you! I'll come too. Lessons, then dinner at the Greek Islands restaurant. R U getting this shirt? A new restaurant just opened. Rudys closed and moved downtown to the old McGraths building. Wow!! Rudy's had a pretty steady clientele; not just golfers. I hope the new restaurant is decent, rather than just golf course food. My wife and I like to play there, but haven't in a few years. ^ That's the way I need to play golf!! That's the way everyone needs to play golf!! Why do I find it so hard to do so?? Havent heard or seen pics,but Minto Brown Park. which is right by Salem GC, is flooded out. Nice little course and one of my favorite restaurants. I drove down to Eugene yesteday to see my kid at UO.. Went through Harrisburg on my way to Fiddlers and found a world much differnt then here in Keizer. I bet!! Lots of lowland there by the river. I wonder if Salem GC got water? Man that sux! The golf Gods let you think spring and golf weather was here, then Bam! We had warm sunny weather for a week in February, it was magical, then snow, rain and bitter north east winds. We all listen. Keep 'em coming!! Congratulations!! These guys were all top 50 in the wold prior to winning the Masters. So we may have a differing definition of big name. Guys that qualify for world golf events are big names IMO and you just about have to be on that list to play in the Masters or else so far off that list that you can’t win. Yeah, I consider the top guys to be Top 10, maybe Top 20, but certainly not Top 50. The ones we talk about every week; the top power ranking guys. BTW, the biggest name in the field this year is Kiradech Aphibarnrat. Yeah, I just left Corvallis this morning after visiting my dad. Hwy 34 is the bridge out of Corvallis shown in pictures was how I got into town on Monday. Obviously, I wasn't leaving that way today. I took Hwy 20 north to Albany which is 10 miles from Corvallis; took me an hour with all the traffic being re-routed. BTW, Trysting Tree GC pro Sean Arey grew up here in the Tri-Cities WA. I was a State-rated Volleyball referee with his mom here in SE Washington. Another BTW, Trysting Tree GC was built on an OSU experimental agricultural farm. I worked on that farm while I was attending OSU back in 1966.